Image credit: Abhijeet Bagal. Click to enlarge. Researchers from North Carolina State University have created stretchable, transparent conductors that work because of the structures’ “nano-accordion” design. The conductors could be used in a wide variety of applications, such as flexible electronics, stretchable displays or wearable sensors. The dimensions of each ridge directly affect the transparent conductor’s stretchability. Image: Abhijeet Bagal. Click to enlarge. 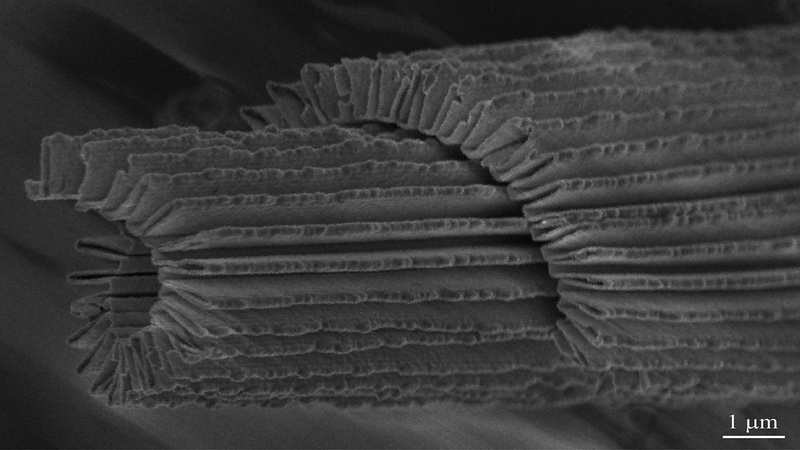 “There are no conductive, transparent and stretchable materials in nature, so we had to create one,” says Abhijeet Bagal, a Ph.D. student in mechanical and aerospace engineering at NC State and lead author of a paper describing the work. The researchers begin by creating a three-dimensional polymer template on a silicon substrate. The template is shaped like a series of identical, evenly spaced rectangles. The template is coated with a layer of aluminum-doped zinc oxide, which is the conducting material, and an elastic polymer is applied to the zinc oxide. The researchers then flip the whole thing over and remove the silicon and the template. What’s left behind is a series of symmetrical, zinc oxide ridges on an elastic substrate. Because both zinc oxide and the polymer are clear, the structure is transparent. And it is stretchable because the ridges of zinc oxide allow the structure to expand and contract, like the bellows of an accordion. Written text can be clearly seen through the transparent conductor. Click to enlarge. The 3-D templates used in the process are precisely engineered, using nanolithography, because the dimensions of each ridge directly affect the structure’s stretchability. The taller each ridge is, the more stretchable the structure. This is because the structure stretches by having the two sides of a ridge bend away from each other at the base – like a person doing a split. The structure can be stretched repeatedly without breaking. And while there is some loss of conductivity the first time the nano-accordion is stretched, additional stretching does not affect conductivity. Video of the conductor in action can be seen at https://youtu.be/Fl2uldbFYwc. The researchers are also experimenting with the technique using other conductive materials to determine their usefulness in creating non-transparent, elastic conductors. The paper, “Multifunctional Nano-Accordion Structures for Stretchable Transparent Conductors,” is published online in the journal Materials Horizons. The paper was co-authored by Erinn Dandley, Junjie Zhao, Xu Zhang, Christopher Oldham and Gregory Parsons of NC State. The work was supported NASA under grant number NNX12AQ46G. Abstract: Multifunctional nano-accordion structures exhibiting a unique combination of conductivity, stretchability, and transparency are fabricated through a combination of nanolithography and atomic layer deposition. The nanostructured material demonstrated two orders-of-magnitude improvement in stretchability, repeatable electrical performance for cyclic stretching and bending, and broadband optical transmission up to 70%. The proposed experimental techniques and analytical models enable the deterministic design of nano-accordion geometry to control material stretchability. The proposed nanostructures are promising for applications in transparent flexible electronics, stretchable displays, and wearable sensors.